The open water fishing season is winding down with the falling temperature and shorter days. Don't despair... less daylight and less fishing means more time to tie flies and restock for next year! Our November monthly meeting is Wednesday the 16th at the Aksarben Aquarium. Our guest speaker for this month is Cameron Ciponneri of the Frying Pan Anglers. Click HERE for info on the Frying Pan Anglers. Cameron will be highlighting some of the great fishing opportunities of Colorado. Doors open at 6:30 pm, the meeting starts at 7. As usual there will be great raffle prizes and plenty of fish talk. Hope to see you there! Our Fly of The Month for November is the iconic Royal Coachman. 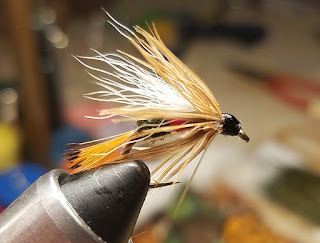 Check our Fly of the Month tab for a recipe. Bring your best rendition to the meeting! Our first "TIE-IN" of the season is Saturday the 19th at the Aksarben Aquarium from 10am to 2pm. Bring your vise, some materials, and a pot luck dish to share with friends, and tie some flies with great company. If you don't have materials or a vise, the club will hook you up and help you get started tying. See you there! Wow. This seems like a really interesting event to attend. I would love to avail the opportunity presented, and really look forward to being there.